It might just be the most dangerous application in the world of e-commerce, but will consumers use it? ShopGenuis, made by NetPlenish Inc., is a free browser tool (for those using Chrome, Safari, and Firefox) that provides automatic price comparisons on top sites such as Amazon, Walmart, Target, Staples, and BestBuy among many others. 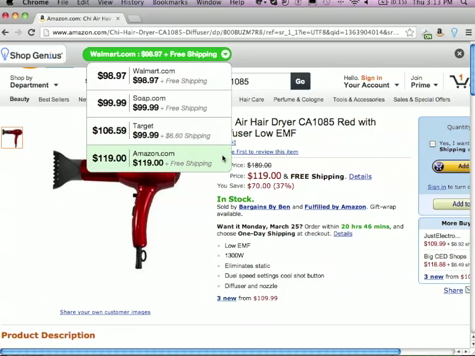 If someone is shopping for a new camera at Amazon.com for example, without leaving the page they are on, ShopGenius will automatically appear in the top corner of the user's browser window either confirming Amazon is the lowest price, or showing them another online merchant with a better deal. If they like the better deal, they simply click that store and a new window will open up taking them directly to that product and merchant. With shopping cart abandonment rates reaching record levels this is either a really good or really bad thing for merchants. What's your opinion - would you use ShopGenuis? Are you worried that your users will and find a cheaper price elsewhere? Share your thoughts by commenting below!